played on Monday, 25 August, 2003 at 3p.m. Above: Stephen Rose (no.4) and Leroy Chambers challenge for an aerial ball as Paul Robertson, Ged Murphy (Droylsden) and Steve Aspinall look on. Altrincham moved up to 8th with their first win of the season and their first win at the Butcher's Arms since relegation from the Conference. They took the lead after 32 minutes when Matthews's header smacked against the crossbar from Robertson's cross but Thornley controlled the rebound and drove it home. The game was decided by Adam Farley's failure to deal with a punt forward from Rose which allowed Thornley to get to the ball and be brought down by Droylsden keeper Phillips, who was inevitably sent off. The Alty no.6, Steve Aspinall, converted the penalty against stand-in keeper, Wright (seen below, 53 mins). Alty then threatened to run riot as Matthews got through to drive home a third (56 mins). However, Droylsden threw everyone forward and Alty suffered some uncomfortable moments with Kilheeney pulling back a goal after 63 minutes. But a minute from the end substitute Dave Gardner beat Wright from 25 yards to make it 4-1. Both sides had drawn their opening two matches but Droylsden had won on Saturday whilst Alty had drawn for a third time. The Butcher's Arms is not a happy hunting ground for Altrincham who had lost all three previous league encounters here. However, in 1978/79, Alty had won 2-0 at Droylsden to secure a memorable FA Cup 3rd Round tie at Tottenham. Alty had Mattie Hughes missing, suspended for an offence committed before he came to Moss Lane, whilst Mark Maddox was sidelined by a hairline fracture to his heel sustained at Alfreton Town. Mark, who watched the game on crutches, will be out for up to five weeks. Also out of the squad was Barry Shuttleworth and this allowed Steve Lunt to join the substitutes, only 24 hours after playing a Youth team match. Dave Gardner dropped to the bench whilst Rob Matthews and Paul Robertson came back into the starting line-up. Peter Band joined Rod Thornley up front. Droylsden have six recent ex-Robins at the club -Steve Porter, Adewale Ajetunmobi, Adam Farley, Leroy Chambers, Carl Furlong and James Glendenning. There was no sign of Furlong but "Ajet" and Glendenning were both involved in the warm-up but did not figure in the playing squad today. Glendenning sported a nasty scar under his right eye, which presumably explained his absence, whilst Ajet sported a dodgy piece of woollen headgear, which presumably did not account for his exclusion. Farley came in to the back four to start his first game of the season, whilst Chambers and Porter also started against their former team. Up-front was Droylsden's new signing from Mossley, Ciaran Kilheeney, who played against us in pre-season for Mossley and had previously been on trial at Exeter City. The Bloods' captain was veteran ex-Northwich centre-back, Gary Burke. DROYLSDEN (Red shirts, black shorts & socks): 1. Paul PHILLIPS, 2. Neil HALL, 3. Danny WARNER, 4. Adam FARLEY, 5. Gary BURKE (capt. ), 6. Alex KEVAN, 7. Ged MURPHY, 8. Steve PORTER, 9. Leroy CHAMBERS, 10. Darren WRIGHT, 11. Ciaran KILHEENEY. Subs: 12. Chris O'BRIEN, 14. David KERR, 15. Gavin SALMON. ALTRINCHAM (Pale blue shirts, white shorts, black socks): 1. Richard ACTON, 2. Gary SCOTT, 3. Chris ADAMS, 4. Stephen ROSE, 5. Gary TALBOT, 6. Steve ASPINALL, 7. Rob MATTHEWS, 8. Ian CRANEY, 9. Peter BAND, 10. Rod THORNLEY (capt. ), 11. Paul ROBERTSON. Subs: 12. Dave GARDNER, 14. Steve LUNT, 15. Neil RYAN. Altrincham kicked off and, following a throw-in near the right-hand corner-flag, the ball came across to Matthews whose firm goal-bound header was saved well by Phillips (1 min). Alty continued to enjoy the better of the opening period and soon Phillips, under challenge from Thornley, caught the ball and carried it out of the left-hand side of his penalty area. This was a repeat of the incident at Moss Lane on Saturday when the Frickley keeper committed the same offence and was booked. Phillips, however, escaped punishment other than a free-kick, from which Kevan sliced the ball out for an Alty corner. Phillips completely missed Aspinall's corner from the left and the ball eventually came back to Aspinall whose firm drive went well over the target (8 mins). 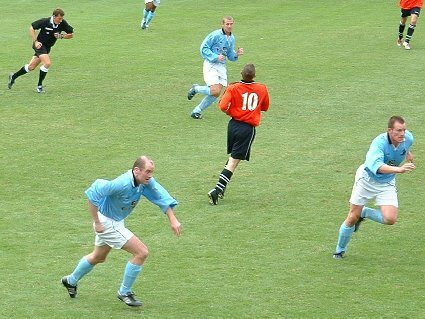 Left: Rob Matthews and Peter Band lead the chase as Ian Craney and the referee follow on. Droylsden now began to attack and Acton had to be alert to beat Chambers to the ball before an error by Scott allowed Warner into the left side of the Alty box from where he won a corner. This was cleared by Craney. Leroy Chambers was beginning to make his presence felt with a determination which had been present in our UniBond championship year (98/99) but had been sadly lacking from his last year or so at Moss Lane. A trip by Robertson on Kevan allowed Droylsden a free-kick, from 22 yards out, which Acton held at the second attempt (17 mins). Steve Aspinall was then harshly booked for a 50-50 challenge in midfield (18 mins). Droylsden were now enjoying more of the attacking pressure but it was Rod Thornley's superb volley from the edge of the box which was the best goal chance of the next few minutes (22 mins). Rob Matthews, backtracking, then had to head out of play to concede a Droylsden corner on their left which Acton caught (23 mins). A constant flow of end to end football entertained the crowd of 502, as Rod Thornley battled to win the ball in the right corner and he found Band in the goalmouth but the chance went begging. Altrincham took the lead when Adams fed Robertson, whose cross from the left was headed firmly onto the crossbar by the incoming Rob Matthews from somewhere near the penalty spot. Rod Thornley picked up the rebound and planted the ball into the back of the net from about 15 yards, in the left-centre of the box (32 mins). With Alty now ahead, the sides continued to trade attacks before Thornley made a fine dribble into the box (39 mins). Gary Scott was then booked by Mr Bennett for a fairly minor foul in midfield. The resulting free-kick led to a Droylsden corner on their right but Acton caught Porter's testing inswinger under his bar and held it well as he fell to ground (43 mins). Indeed, throughout the game, Acton's handling was good. After the already-booked Aspinall had twice more been penalised for questionable offences, the referee gave him a lecture for dissent. The half ended just after Murphy had curled an effort wide (45 mins). For the first time this season the Alty fans had seen a first-half goal and had also seen their side score the first goal of a match. Aspinall (no.6) nets Alty's penalty against stand-in keeper Wright. Leroy Chambers earned an early second-half lecture for a foul on Rose before Acton caught a free-kick, awarded against Scott for a tackle on Chambers (49 mins). Warner then fouled Thornley but Porter soon gained his side a corner off Rose on the Droylsden left. Matthews mis-hit his attempted clearance from Murphy's corner but then threw himself brilliantly in front of Kevan's goal-bound shot from the left of goal (51 mins). The decisive point in the game arose from a huge aerial clearance by Rose which Farley attempted to shepherd back to his keeper, hotly pursued by Rod Thornley as the two ran down the centre-left of the pitch from about 25 yards out. Inexplicably, Farley neither helped the ball back into the area to his waiting keeper nor cleared the ball into touch but instead waved to Phillips to collect the ball. Thornley nipped past the slowing Farley and Phillips was therefore left with little option but to bring down the Alty striker inside the box. The penalty was awarded and Phillips dismissed. As he walked off, the keeper threw down his gloves and jersey and angrily remonstrated with Farley. Wright, one of his side's shorter players, took over in goal but was immediately left flat-footed as Aspinall drove home his second penalty of the season, to the left of the keeper (53 mins). Soon after the restart the sub-keeper dropped the ball, as Thornley challenged, but the waiting Talbot could only hook the ball over the bar. However, Craney soon played in Matthews behind the defence and the Alty man strode on to drive his shot past the hapless Wright to make it 3-0 (56 mins). At this stage it looked like Alty could have a field day with an extra man and an inexperienced keeper. To their credit Droylsden did not allow this to happen. They brought on Kerr for Warner and kept attacking as they now played with a back three (58 mins). Nevertheless, Alty soon won a corner but Aspinall, for once, wasted it. Alty then made a meal of clearing the ball from their own area before Thornley got in a fine low shot at Wright, which the replacement keeper did very well to save, one-handed, low to his left. As Thornley closed in, Wright held on well to the ball (61 mins). Acton then did well to tip over Kevan's effort from right of goal, after good work from Kerr (62 mins). Rose headed the resulting corner clear but Droylsden were soon back and when Chambers beat Rose in the air in the front of the box to the left of goal, his nod down gave Kilheeney the chance to drive the ball past Acton to make it 3-1 (63 mins). However, Alty then won two corners from breakaways, the latter coming when the unusually quiet Craney attempted to beat the keeper at his near post (65 mins). With a man advantage Altrincham now seemed to be content to sit on their lead and when Droylsden brought on O'Brien for Murphy the home side signalled their attacking intent still further. However, Alty won another corner before a Rose error gave Droylsden a flag-kick of their own in their right. A breakaway by Thornley led to an appeal against Farley for a penalty but his handball was accidental. Gavin Salmon now replaced Kevan for Droylsden just before a flick from Chambers allowed the impressive Kilheeney a firm shot from the right which bounced off the top of the cross bar and appeared to stay in play but the referee thought otherwise (73 mins). Droylsden continued to press but another Thornley foray earned another corner and from Robertson's kick Talbot rose well but headed over the bar as he ran out of space to direct his header at the back post (75 mins). Droylsden then won a corner before Gardner came on for Matthews, who had had a good game (78 mins). Alty remained on the back foot, with Craney twice losing possession in as many minutes, and Neil Ryan soon came on for the out of sorts young Alty midfielder (82 mins). Alty were failing to test the stand-in keeper at all as Droylsden refused to give up. The visitors gained some relief when a Porter error gave them a corner which Robertson surprisingly took short rather than trying to see if Wright could be tested with an inswinging ball under his crossbar. After a surprisingly long four minutes of added time had been decreed, Dave Gardner finally showed his team-mates the way to goal when, from a Ryan pass, he fired an excellent 25 yarder into the top right of the Droylsden net from a central position (89 mins). As the players left the field, Dave Pace ignored the outstretched hand of Graham Heathcote, which was a pity after a game played in a good spirit. This was a well-deserved win and good team performance, from the sure handling of Acton at the back to the lively running of Thornley and the tireless battling of Band up front, whilst Rob Matthews had his best game yet in an Alty shirt. As last year it has taken Altrincham till their fourth game of the season to record a victory though, unlike then, three draws rather than three defeats preceded today's win. Alty, who are now one of just four unbeaten teams in the Division, moved up to eighth, the highest position we have held since April 2002. Including their ten pre-season friendlies, Alty have lost just once in their last 14 outings.